There is no shortage of articles and industry events that predict the end of banking as we know it. While overheated predictions are great for increasing trade show attendance and social media engagement, this webinar will focus on the real world. Banks and Credit Unions are moving into uncharted waters where the partnerships are different, the customers are different, and the competitors are different. 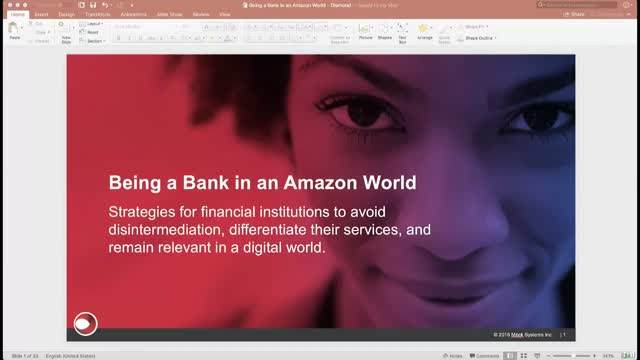 This webinar will pull no punches in pushing financial institutions to improve execution in the tasks immediately in front of them, but will also help inspire the innovation necessary to be a winner in the digital future. -Understanding: While the coming years will see unprecedented change in how customers interact with their financial institution, this isn’t the first time the industry has faced technology change. What can be learned from past introductions of new technologies? -Preparing: What are the major trends financial institutions should be planning for now? -Growing: How can financial institutions pivot to attract new customers? -Opening: Financial institutions in the physical era were closed and focused on products; how can successful financial institutions in the digital era be open and focused on services (APIs)? -Measuring: What are some metrics that indicate if a financial institution is on course for a successful digital future, and how can financial institution leaders motivate their teams for change? Hype is for conference organizers. This webinar is about reality. We will focus on the world financial institutions live in today, and the world that is to come. It’s an exciting time to be in financial services.